This route criss crosses the frontier between Italy and Switzerland as we explore the highest peaks around the Monta Rosa area (this tour gives you the chance to do a 4000m peak every day). 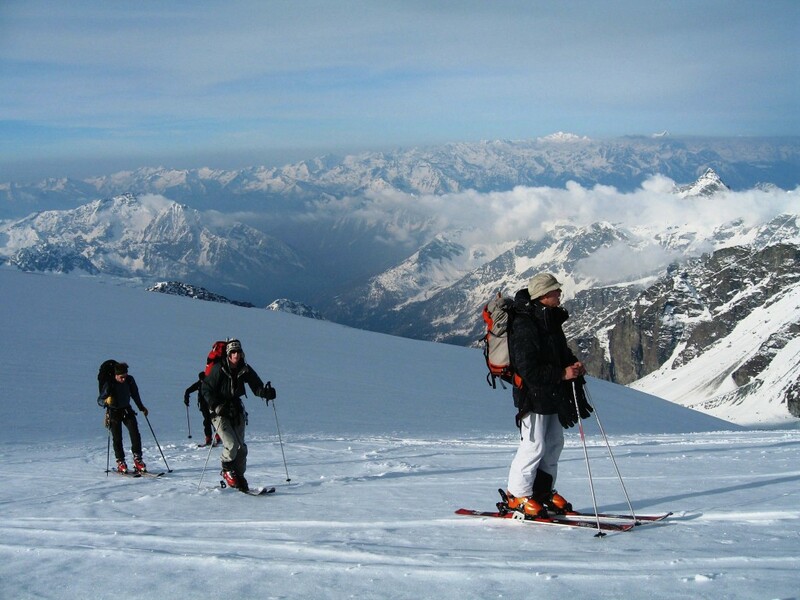 The tour will provide a real challenge to fit and experienced ski tourers as it is at high altitude (as high as 4633m) and covers some steep and technical ground in one of the most glacier filled areas of the Alps. 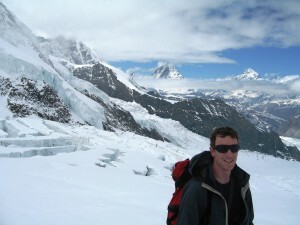 During the week we will ski the Breithorn, Castor and the Zumsteinspitze on the Monta Rosa. Price: 1525€pp which includes six days ski touring with a qualified UIAGM high mountain guide, all accommodation, dinners, breakfasts, picnic lunches, transfer from Zermatt and return. Extras: Lift passes, hire gear. 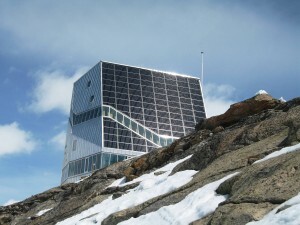 Day One: This tour starts from Zermatt and the group will meet there at the hotel. You can choose to fly to Zurich or Geneva from where you can easily catch a train to Zermatt. Day Two: The first day of the tour starts with a cable car ride up to Kleine Matterhorn. From the top of the lift system the Breithorn (4164m) is an easy 4000 metre peak – an ideal warm up day. The views are no less stunning though and the peak is really worthwhile. Best of all though is the long ski down to the Ayas hut from the top. Day Three: From the Ayas Refuge we can head to the Castor (4221m) if the conditions allow otherwise we make our way to the Schwarztor Pass and then descend onto the crevasse and seracs filled Schwarztor glacier. 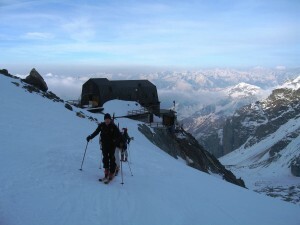 From the bottom of the glacier we skin up to Monta Rosa hut for the night. Day Four: Staying in the same hut for two nights allows us to tackle the one of the summits that make up the Monta Rosa massif, the Zumsteinspitze (4563). With a climb of 1700m this gives us the day to achieve this summit. We pass by the highest refuge in Europe, the Gnifetti (3647m). Day Five: This is the longest day of the tour – we leave when it is still dark from the Monta Rosa refuge for the Stockhorn Pass (3395m), continue to Adler Pass (3789m) and before our descent to the hut we can choose to climb the Strahlhorn (4190m). We then have a long and relatively gentle descent to the Britannia Hut (aside from the small climb at the end). Day Six: Today we link in with the downhill ski area of Saas Fee before climbing up to the Alphubel (4206m), about 1300m of climb for the morning. From the summit we have the view of the week over Mont Blanc and all the 4000m peaks of the region, and the Oberland. We ski down one of the more isolated valleys in the region to reach the Täsch Refuge. Day Seven: Our aim today is the Rimpfischhorn (4001m), the “winter summit”. We then have a couple of different options for our return to Zermatt, depending on the conditions and the fatigue of the group. Comfortable beds and a few beers await us there. Day Eight: From Zermatt we meet rail connections back to Geneva or Zurich to liaise with your flights home.